Each morning after ceremony, a flower bath is conducted by Don Rober and Doña Eliana. I made my way down to the little concrete alcove surrounded by large bamboo stalks, and received a refreshingly cold awakening, which marked the official end of the ceremony. Thanking them both in my broken Spanish, I shared that I had a beautiful experience the night before. Doña Eliana was glowing with a protective, motherly, comforting presence, which I took delight in being around. The following two ceremonies didn't quite play out as significant as the first, however I knew something deep within myself was brewing. It was only a matter of time before I was to experience the most gruelling, terrifying, relentless experience of my entire life thus far. Morning flower bath. Sharing a laugh with Doña Eliana. The experience of visiting the Yahua tribe today was lively, enriching, and a lot of fun! We climbed aboard the boats and sped down river, where we greeted our face-painted, grass-skirt wearing neighbours. Before long, it was time to take up their blow-gun challenge. A wooden tube about eight feet long is used as a native weapon to blow darts tipped with the deadly poison of frogs and snakes, and we each took turns testing our accuracy on a totem several meters away. Casper testing his blow-dart skills. After trading goods for their arts and crafts and playing frisbee with the young children in the rain, we headed back and prepared for our first sharing circle. I wasn't to know that this was where the real sense of bonding began. People, similar to me, opening themselves up to a level of vulnerability I had rarely been exposed to. Stories of incredible hardships and childhood traumas. I could feel the sense of tribe, closeness, and connection continuing to unfold. The shackles I had placed on myself, closing myself off to more open-hearted relations, had begun to break down and unravel. Members of the Yahua Tribe. What I believe to have been a stomach bug infiltrated my system shortly prior to ceremony. Many trips to the bathroom and a splitting headache manifested prior to drinking that wretched tea, and the symptoms only exacerbated throughout. I purged multiple times. My head was spinning. My heart was thumping. The nausea made it hard to sink into the experience. Even so, I was calm and kept as meditative as possible. The visual state was no where near as profound as the first. It was more dream-like, as opposed to the in-your-face maelstrom of psychedelic fractal patterning I had experienced previously. Once again, I felt the presence of the 'others' wavering in my peripheral vision, but their company was ephemeral. Slowly, I drifted away on some sort of raft, a floating platform, in the middle of a vast watery haven towards a majestic castle. Tall Colosseum-like pillars lined a broad ever-morphing pathway, leading up to the multi-levelled fortress. Alas, the visions were weak and fading, and I never did reach the purple and blue hazed wonderland. It wasn't too long until the effects subsided and I retired to bed with my nauseating spinning-head and an overwhelming exhaustion. I woke the next morning free of any unwanted stomach discomforts and intestinal movements, so it seemed as though La Madre traded in the fireworks display for an uneventful visual experience, healing me on a purely physical level and flushing out whatever had decided to seize my insides. Similar visions of temple spaces and patterns I've experienced working with Ayahuasca. Visiting the Bora tribe, next-door neighbours with the Yahua people, was another lively yet tiring afternoon. The chief of the tribe introduced his people and sung a song in his native language. He could have been making up sounds for all I knew, it was a dialect foreign to my ears! I couldn't help but smile and laugh as we joined their traditional dance, linking hands and running around their central hut with not a care in the world. Women of the Bora tribe inside their maloca. Jaguar pelts strung up in the background. The Bora people's artwork, some of which is painted on beaten down and flattened tree bark. It's incredibly surreal being here in the jungle. As I write this, I smile and shake my head. After such an extended time dreaming of the Peruvian Amazon, it's hard to put into words how I feel. Awe. Elation. Hard to believe. I love the chirps, whistles and calls of the birds in the morning, and the buzzing, whirring and eerie chattering of the insects and animals at night. I love walking on the jungle ground in bare feet, feeling the Earth against my skin, and the sensation of the sun and breeze penetrating my shirtless torso. I love being surrounded in all of this raw nature. I love the people here. Not just the others walking this spiritual medicine path, but the lovely hard-working members of the Sanctuary, cooking and serving our food, attending to our daily needs. I truly wish I spent more time learning the language, so I could get to know these beautiful people. The sense of tribe is heart warming. I've really connected with a few people here, but like all my relations, I wonder how long the bonds will last. It's sad that I doubt my ability to maintain connections. It makes me think about tribe, back at home. I've rarely had that sense of deeper connection with a large group of like minded humans. Probably because I've always felt like my true self never really fit in anywhere. I've always worn different masks to fit into different social settings and groups. Did I even know who my true self was? Do I even know now? Will I ever know? I'd love to find my tribe. To find my people back home. I miss it. Or at least, I miss what I imagine it would be like. Can you really miss something if you've never had it to begin with? I guess I have a difficult time letting people into my heart. Maybe there's a blockage somewhere within, that needs to be unplugged. Incredibly vivid dreams ensued after the Bobinsana ceremony, none of which I recollect now. I was lazy upon waking, and wish I'd wrote them down. With a variety of healing properties, especially known for opening and healing of the heart, as an energizing stimulant, and for increased empathy and compassion, this pink flowered shrub is commonly used as an admixture plant to Ayahuasca brews, and also prepared for stand-alone use. The effects came on mild, gentle, a warm fuzzy sensation throughout my body. We all sat in the ceremonial maloca, aware that it was a lot more casual than the Ayahuasca rites. Don Rober gave us our arkana, and performed the same rituals we'd witnessed the previous two ceremonies: blowing his mapacho smoke through the circular opening at the top of the bottle of liquid and whistling his icaros in; pouring his blessings of protection and healing directly into the drink. If only his blessings could change the flavour of these Amazonian teas. At least the incredibly sweet, cough medicine-esque resembling drink went down easier than the foul visionary brew. We smoked our mapacho cigarettes and joined in on Don Rober's icaros, dancing and hugging the night away. A heart opening ceremony for many, yet I couldn't help but turn my attention inwards and ponder the questions on my mind; Mother Ayahuasca, I'm here to find meaning, clarity and purpose in my life... Can you help guide me?? I don't even know how I'm feeling right now. Confused. Unsettled. The ceremony, or rather, post-ceremony, really threw me off guard. It was more intense than the last. Once again, I felt the presence of the others. They appeared in front of me; incredibly tall indigenous beings. I peered up behind my closed eyelids, but couldn't see beyond their elongated legs. Other entities would pass through and peer at me, investigating whatever part of me it was that had landed in their world. Ayahuasca Shipibo-esque patterns persisted parallel with the nausea and uncomfortable buzzing within my head. By the time everyone's personal icaros had begun, my symptoms had dissipated, and I left the sacred space when the candle was lit. Meandering up to the Star Deck at the back of the Sanctuary, I lay down on the circular meditative area; my hands positioned under my head, creating a soft resting place. I played Ben Lee's album, Ayahuasca: Welcome to the Work and sunk deep into my mind, reflecting on my life. As I looked at the cloudy sky, the moon covered in a white mist, my consciousness connected directly to the atmosphere above and dissolved straight into the heart of it. The effects of the medicine had worked its way back into my being. Visions re-appeared. A black spongy loofah was scrubbing down my field of view whilst white suds of soap emanated from it and filled the external premises. Just like fractal visionary cauliflower, mild psychedelic patterns manifested as I disintegrated further into this bizarre landscape, being whisked away by the ethereal sounds and vibrations of the music. It was as if the sponging of my mind had wiped away the blockages so that I could explore previously inaccessible memories with this heightened emotional capacity. Artwork I came across that resembled this visionary re-appearance on top of the Star Deck. On the way down from the Star Deck, my dear friend Peter and I shared a moment on the walkway, overpassing a trickling stream in the dark of the night. Something inside me had cracked. The floodgates released as tears streamed down my face. I sobbed, deep powerful sobs, as Peter held space and embraced me. He provided some thoughtful insights to me in my incredibly vulnerable and fragile state of being. I wasn't sure if I was being irrational and overly emotional, or if I had tapped into something that I hadn't quite understood the magnitude of. It was all regarding my insecurities, my jealous nature, my possessive and manipulative behaviour, my egoic confusion, my dark side; all of these character traits from my shadow self that I was now accessing deeply from an objective viewpoint. I would harbour these qualities below the surface and eventually let them rise, showcasing them in intimate relationships; just like old familiar clothing in the cupboard, slipping right back on time after time. With the help that Ayahuasca provided by temporarily (or perhaps permanently? - Neurons that fire together, wire together) altering my brain chemistry, I was now able to recognize how these issues had stemmed from my parents divorce and my experiences as a child. I'd held resentment towards my parents for basically my whole adolescent and adult life. It was because I'd always felt like I had to wear a mask around my family, concealing who I really was. I was uncomfortable being my true self, for fear of judgement and ridicule. This would then lead me to thinking that my parents thought they knew who I really was, when they really had no idea of my inner interests and characteristics. Thus, the unconscious perpetual cycle was born and solidified. I would continue to bury my truest feelings of self, and the resentment would continue to grow, leaving an emotionally and mentally confused young boy to develop into the body of a man. According to memory, my mum played little part in my younger years before deciding to leave and end the 'family dynamic'. I never thought this bothered me, but sub-consciously, it had obviously left hidden aspects within; instilling me with fears, insecurities and the feelings of being alone, unloved and unworthy, which I was to carry with me and project onto any females where an emotional attachment would emerge. Making my way along the walkway to wallow in my thoughts, I spotted two eyes in the light of my torch, glistening like green gemstones in the dark of the night. Fear and curiosity struck me simultaneously, and I fastened my pace to catch another glimpse. As I neared and shone my headlamp, I saw a cat-like tail slink off into the under-brush; a timely metaphor for the deeper memories I needed to uncover, yet still eluded me. Sunrise from the Star Deck. A sacred Chavin totem guards the meditative space. Nothing I'm about to write or say will ever compare to what I just went through. I feel the more I write, the less meaning this will have, yet, here I go… Without a doubt, the single most terrifyingly intense experience of my existence thus far. The evening prior to ceremony I spent some alone-time in the wild, exploring both the jungle trails and the crevasses of my mind. Butterflies everywhere. The musky scent of decaying forest matter wafting through my nostrils. I purposefully squelched the mud in-between my bare toes. It was humbling connecting with nature, yet I knew something was rousing internally. I was emotionally stirred and wearily apprehensive. Jungle trails at the back of the Sanctuary. Standing at the alter, the white wizard Don Howard signalled to wait after I'd downed my first cup. "Can you handle another?" These were not words I was thrilled to hear. The first was bad enough. The second was punishing. It's true that the taste and smell become worse over time. Putrid. The body and mind know what's coming. No longer than five minutes had passed when my body wanted to expel the liquid, but I fought the urge and held it within, making sure I'd uptake the necessary amount. I continued my ritual of heading to the bathroom to urinate straight after drinking, before returning to my seat and focusing on my mantra. "Breathe, relax, observe, let go..."
The candle was blown out; the room cast into darkness. The icaros were yet to be heard before I needed to vomit. As quick as this urge came on, I was transported to a place I didn't know existed. A place of intense, archaic, pure poison. There were no visitations from inter-dimensional beings, no traversing through beautiful other-worldly paradigms. The place was reminiscent of the typical Shipibo geometric patterned artwork. Stark contrasting colours against a white backdrop; reds, purples, yellows, blues, oranges, greens. Flashing harshly, like a warning sign, or more appropriately, like danger lights. 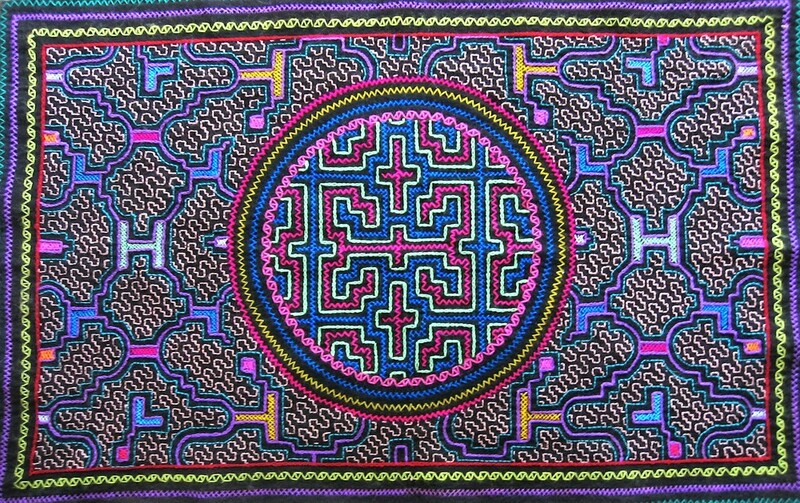 The Shipibo people's patterns and artwork, reminiscent of the visionary state. In amongst the flashing were countless snake and dagger symbols: the same symbolism used for medicine - the rod of Asclepius. It conveyed to me that there was serious poison inside of me that needed to be expelled. This was the Amazonian version of a medical operating procedure. Relentless. Horrendously relentless. It was everything combined to make up this place of pure, hellish, deathly poison: the visuals, the nausea, my entire physiological, psychological and energetic essence. The time had come to rid myself of the poison and toxicity that I'd carried around with me for the majority of my life. Representation of the Rod of Asclepius. It was so intense that I was teetering on the edge of calling one of the shamans to try and bring it down a notch. The icaros were so fast, it felt like they were being sung just for me, like the curanderos knew I was severely poisoned and it had to come out. In the midst of it all, and as intense as it was, I knew it had to be expelled, so I decided against help and chose to ride it out. Surrender was too far beyond reach for my ego, I couldn't let go, it felt like I was hanging on for dear life. When any negative thoughts, feelings or memories came up, the intense flashing danger patterns would fade. These toxic feelings and thoughts would manifest into black and brown, decaying, decomposing visions and I was violently forced to throw them up. I was physically purging mental and emotional trauma from the depths of my soul. Gut wrenching. Explosively cruel. I could feel my stomach and my intestines squeezing themselves, wringing themselves out, trying to force out every last little bit of malevolence within. There were times where spiders and strange insects were crawling erratically over my skin. Even more bizarre, was that I felt like the space I was in was incredibly familiar. Like I'd been there before. There was a low pitched droning sound in my ears, and I faded in and out of what felt like the place between life and death; the landscape of dying. Even when the intensity came down a notch, I still felt like I was at the complete mercy of Ayahuasca. The candle came on, yet the medicine was still coursing through me. I needed fresh air. Stumbling outside, I made my way to a chair. It felt like the Earth was a spinning top, like I'd spent much too long on a merry-go-round. I dry reached over the balcony and decided I needed to lay down, so I slowly felt my way along the path, until I reached what I hoped would be the comfort of my room. The nausea didn't let up easily though, and I continued to trip out as I tried to rest. A truly harrowing, terrifying experience. I know it seems over-dramatic, but honestly, I was glad to be alive afterwards. Something I came to realize was that in a sense, my intentions were slightly off, yet I received exactly what I really needed. During the third ceremony, I went in with something Don Howard had mentioned: "Picture yourself as an empty vessel, waiting, and ready to be filled." Well, it was clear that I was not an empty vessel at all when I was puking my guts up for several hours! How could I be filled up, when I was already full of a lifetime of poor habits and conditioning, that I was not only spreading throughout myself, but projecting onto other people? I'd asked for clarity, meaning and purpose in life, but the clarity I needed was very different to what I had wanted, let alone expected. I knew I couldn't continue on living as a toxic, poisonous vessel. The experience had taught me some valuable lessons and provided some much need insight. It had scared me straight. The following morning I was rattled. Completely scattered. But strangely enough, that all changed the moment of the flower bath. The icy water against my skin was stimulating. I kindly asked Don Rober to bless my jaguar tooth talisman. "Por favor" I asked. "Para la proteccion." - Please, for protection. Morning of the final flowerbath. He whistled his tunes and let the smoke caress around the form of the necklace, exactly like I'd seen him do in ceremony. I was filled with gratitude. When I stood up and placed it back around my neck, I instantly felt an electric surge of strength and power sizzle through my body. The mental and physical shift was immediately noticeable, so much so that others were commenting on the transition. Now I'm sure the cold water produced some sort of chemical change within, such as the release of adrenaline. But whatever happened, it definitely caused a dramatic shift in character. From my current understanding as I write this, I'm not sure how any of this truly works being here in the heart of this shamanic culture, but it seems that when you're walking this sacred medicine path and delving deeply into altered states of consciousness, anything is fair game. Striding along the jungle paths, I basked in the new found raw energy. Don Howard crossed my path on the way back and imparted some timely wisdom onto me; a difference between power and empowerment. Power in a person can shift them to harbour undesirable qualities of control, manipulation, anger, fear and jealousy; like a boastful tyrant king. Empowerment within a person can be used to cultivate strength and courage, and these people are often reserved in their power; quietly humble. And indeed this conversation was very humbling, helping to ground my energy within. The work with Ayahuasca had come to a close. Only a week had passed and I had already gained a sturdier foundation. The important part, and arguably the most difficult part is to reintegrate all the insights, teachings, lessons learned and inner wisdom attained back into life, outside of the jungle. They all say, reintegration is the hardest part of the process. I'd been to hell and back. I'd faced and experienced a great battle, going to war with the most potent demons imaginable with my spirit brothers and sisters by my side. I was reset to baseline. An empty vessel, waiting to be filled. I had humbly stepped up a notch, and was earning a broader lens of awareness, a higher level of consciousness. A perfect place to be for the next week ahead, working with Huachuma: the grandfather medicine, and Vilca: the quintessential visionary snuff for life, death, and rebirth.